Jazz Station - Arnaldo DeSouteiro's Blog (Jazz, Bossa & Beyond): Blu-spec CD of the Month - "Joe Farrell: Penny Arcade"
Blu-spec CD of the Month - "Joe Farrell: Penny Arcade"
After having recorded his first three CTI albums -- "Joe Farrell Quartet" (1970), "Outback" (1971) and "Moon Germs" (1972) -- with such famous sidemen as Chick Corea, John McLaughlin, Elvin Jones, Stanley Clarke, Jack DeJohnette and Airto Moreira, most of them suggested by producer Creed Taylor, Joe Farell (1937-1986) was finally allowed to take his touring band to the Van Gelder Studio in October 1973, when his fourth CTI album, "Penny Arcade," was cut. 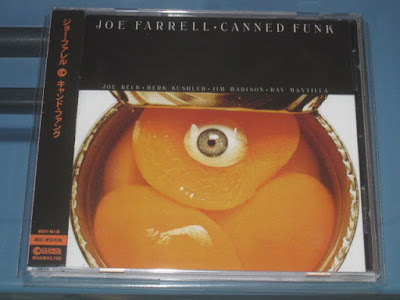 With the extra help of Herbie Hancock, who had performed on the previous "Moon Germs" and would rejoin the reedman some years later on his debut for Warner, "Night Dancing," Farrell's group consisted of Herb Bushler (electric bass), Steve Gadd (drums), Don Alias (percussion) and Joe Beck (electric guitar). My late friend Beck wrote the frenetic title track, while Farrell himself contributed with "Hurricane Jane," the latin-tinged "Cloud Cream" (great work by Farrell on flute and piccolo flute, propelled by Don Alias' pulse) and "Geo Blue," with Hancock on the acoustic piano and a dazzling alternation of tempos and moods. However, my personal favorite track is an unbelievable 13-minute jam version of Stevie Wonder's "Too High." Besides some unreleased alternate takes, the sessions also yielded a groovy Beck original, "I Won't Be Back," featuring Hancock on the Fender Rhodes, which Creed Taylor smartly saved for inclusion on Farrell's follow-up "Upon This Rock." 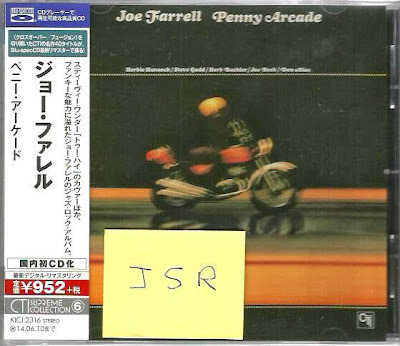 Five months later, in March 1974, Joe Farrell returned to Van Gelder Studio with his wild pianoless gang -- guitarist Joe Beck as the main "side-star" bringing all the fuzz box, wah-wah pedals and extra effects he could handle, Thiago de Mello's former bassist Herb Bushler and drummer Jim Madison replacing Gadd -- to cut three more tracks: "Upon This Rock," "Weathervane (both written by Farrell specially for the date), and Beck's "Seven Seas." The "Upon This Rock" LP picked # 24 in the Billboard "Jazz Albums" chart. 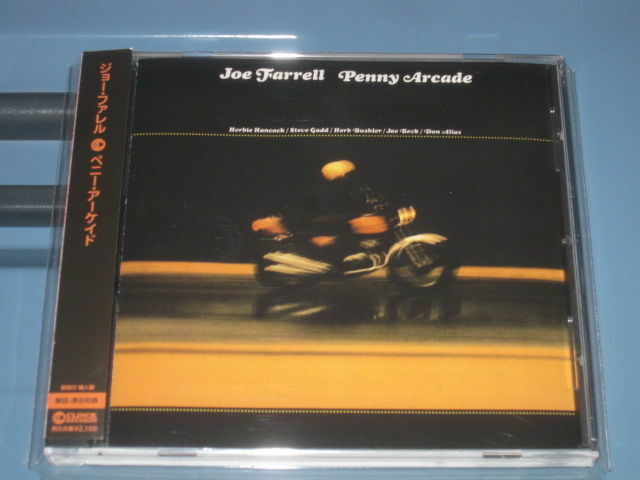 Although this is being marketed as the first "official" CD release of "Penny Arcade" in Japan, that album and its two follow-ups for CTI -- the much-sampled "Upon This Rock" and "Canned Funk" -- became available in the Japanese territory back in 2011, when Clinck Records distributed those three albums through an agreement with Wounded Bird, the company that had reissued them here in the U.S.
Hello Arnaldo. I have the CDs that Wounded Bird released from these three albums in 2011, and I don't like their sound. It was a bad buy. Do you know how I could get these these 2013 issues in flac or wav? Hi David, don't know about their availability in Flac or WAV. And I agree that the mastering quality on the Wounded Bird reissues was far from perfection, but that was all we had at the time, thanks to the unbelievable decision of the sales departments at Sony and King to have never allowed anyone to reissue the albums properly, despite the fact that I had "suggested" it countless times since 1987... What I can tell you is that the 2013 Japanese reissue of "Penny Arcade", on Blu-Spec CD, sounds better than the Wounded Bird CD. Feel always welcome to contact me. I love to talk about music and CTI.